After a day off on Friday because of very strong winds, the Finn fleet at the World Cup Series in Miami returned to the water on Saturday with three more races held in some stiff 18-22 knots easterly winds. It was looking like a battle between Giles Scott and second placed Alican Kaynar, from Turkey, was in the offing, but Kaynar struggled to find the form of recent days and was soon losing points to Scott who extended his lead after each race. Scott won the day with a 3-1-1 to take an almost unbeatable 19-point lead into the medal race. Kaynar, in second, ended the day just three points ahead of USA’s Caleb Paine, the bronze medalist from Rio at his first event back on the circuit since 2016. Scott’s teammate, Ben Cornish has had an inconsistent week so far, starting the day in 15th overall, but managed to put that behind him on Saturday with a win in the opening race of the day after rounding the top mark around tenth. Early leader, current world champion, Max Salminen, of Sweden, crossed second while Scott was third, to extend his lead at the top to four points. 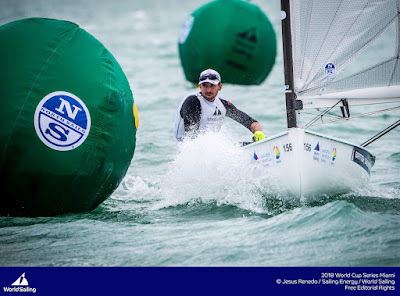 Scott then took control of the next race on the second upwind having trailed Brazil’s 2013 world champion, Jorge Zarif, round the top mark and then Cornish, around the gate. Cornish hung onto second with the two Brits extending on the fleet by a sizeable margin. Croatia’s Josip Olujic recovered from a mast breakage on Thursday to pick up his best race so far with a third place finish. Kaynar finished 14th, to leave Scott with a 10 point advantage with one more race to sail. Into the final race of the day and Paine was in front at the top. However, France’s Jonathan Lobert was in front by the gate, with Scott already up to third. The situation pretty much stayed that way until the final downwind, with Scott coming through for another win – and a hat-trick of race wins for British sailors – from Paine and Lobert. After a great start to the day, Cornish had rounded near the back of the fleet and had a lot of work to do, especially with Lobert right at the front for the first time this week. For a while Lobert looked to heading for the medal race, but then Cornish starting moving through the fleet to finally cross in 11th, while Lobert dropped to third. Cornish just got the points he needed to beat Lobert by one point overall and sit in tenth overall, to take the final place in the medal race, while Lobert ended his regatta in 11th overall. Salminen ended the day in eighth overall, but too far adrift to get a medal. He spent some considerable time in Australia over the European winter, training and taking part in regattas in the ever expanding and enthusiastic fleet there. While Scott just has to turn up on Sunday and finish the medal race to win gold, the battle for silver is between Kaynar, Paine and fourth placed Ioannis Mitakis, from Greece, the early regatta leader in Miami. Mitakis trails Kaynar by 16 points and Paine by 13, so he has some work to do. Also in contention for the bronze are Zarif and Anders Pedersen, from Norway, who both have to win the race to stand a chance.